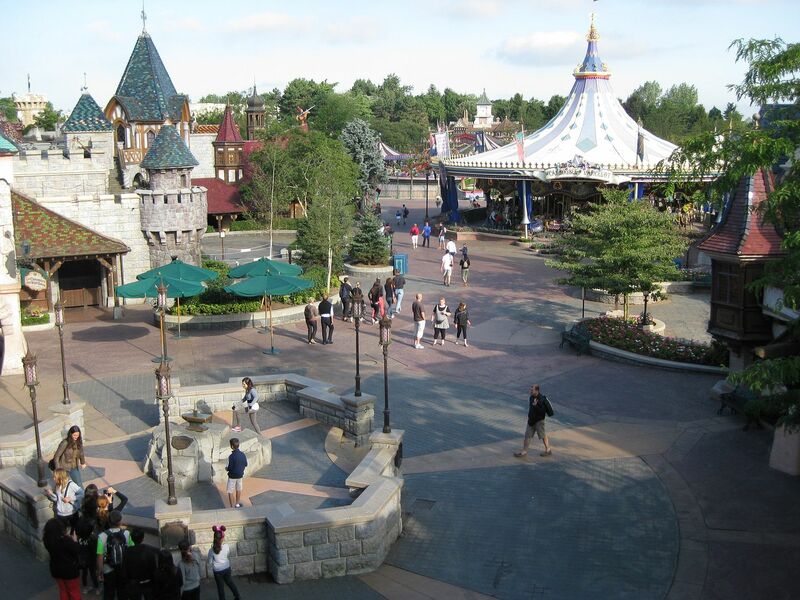 After leaving Adventureland last time, we arrive at Fantasyland. This land is where you'd expect it to be compared to the US parks, although again the size and scale is surprising. size, with a level of detail like Anaheim's. These two dark rides are the same as the Disneyland versions, with visual effects somewhere better than Orlando's old Scary Adventures but not as hi tech as Anaheim. Peter Pans Flight though is wonderful, comparable to Disneyland in visuals, layout similar to Orlando, but with suspended ride vehicles that have articulated bogies to accommodate twice as many guests as the original rides. Also as elsewhere, the ride is very popular for no apparent reason and commands long lines and early Fast Pass emptying in peak season. At the rear left of the land is the Fantasyland train station, in a popcorn light-lined building that'd be at home on Main Street. The majority of the building was originally for a theatre show, and was reworked last year to be a controlled meet n greet for Mickey Mouse similar to Orlando. 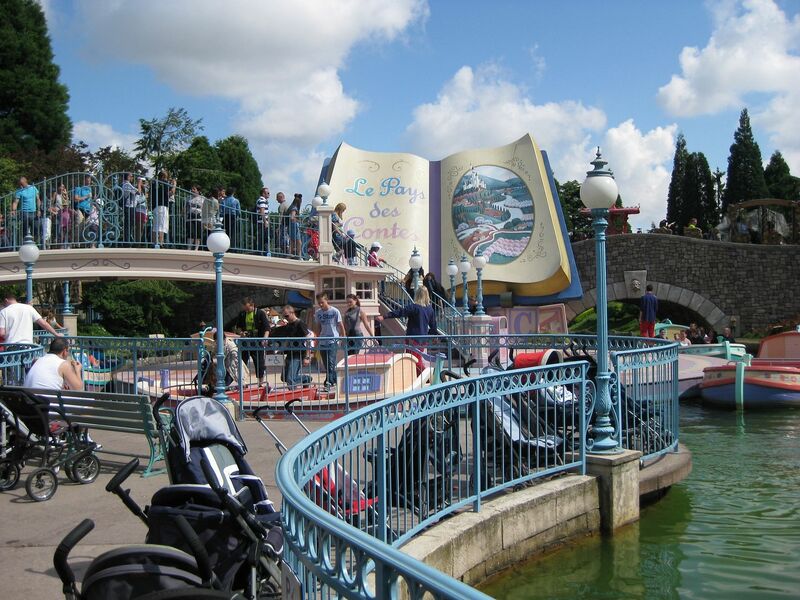 Next to the station is a 1993 addition, Storybook land. 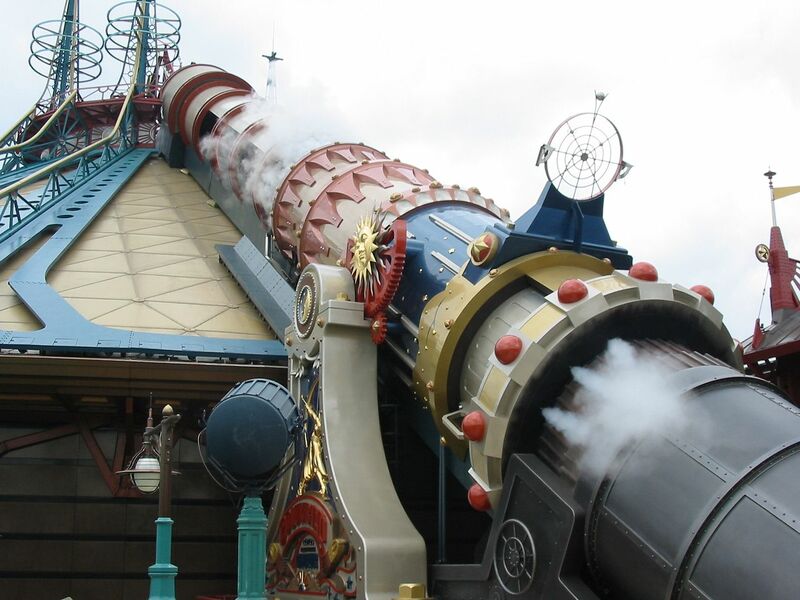 Accessed under the railroad similar to Toontown in Disneyland, two rides wind around a large, themed, shared landscape. The canal cruise is very similar to Anaheim's, slow moving boats travel a canal with miniature displays from popular animated movies complete with audio. Looping around the land is Casey Jr, a family coaster that's notable for being the first coaster ride with onboard music synced to the ride, a precursor to the Soundtracker systems of Space Mountain. 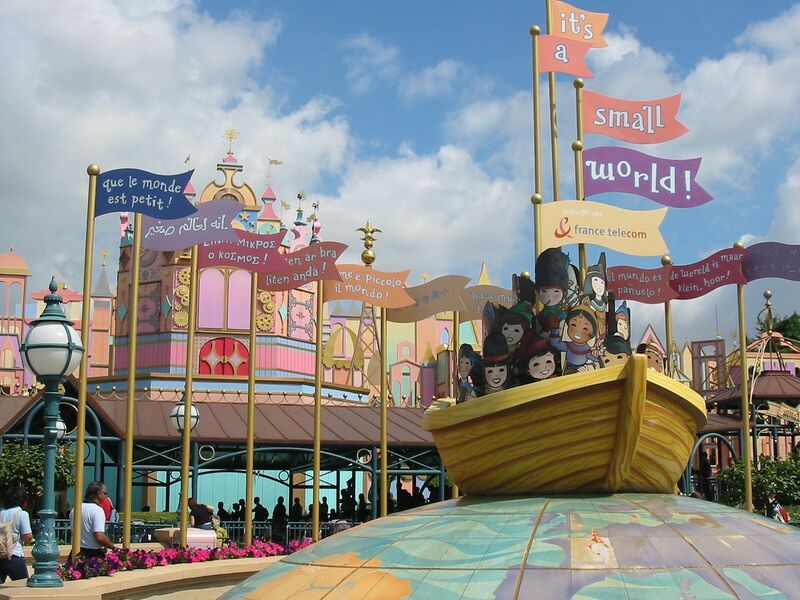 The final major attraction is It's a Small World. This is one of the E tickets that was completely redesigned for Paris during the money is no object period, and it shows. The exterior is similar to Anaheim, with outside canals and multi level facades that the railroad passes through. Load and unload is outside too, though under ornate canopies which also cover the queue and the exterior ride sections. Inside the ride is a joy. Bigger, grander, prettier. Using Orlando's flooded rooms as opposed to Anaheim's Flumes the ride is truly a wish list of what you'd do to improve the earlier versions. 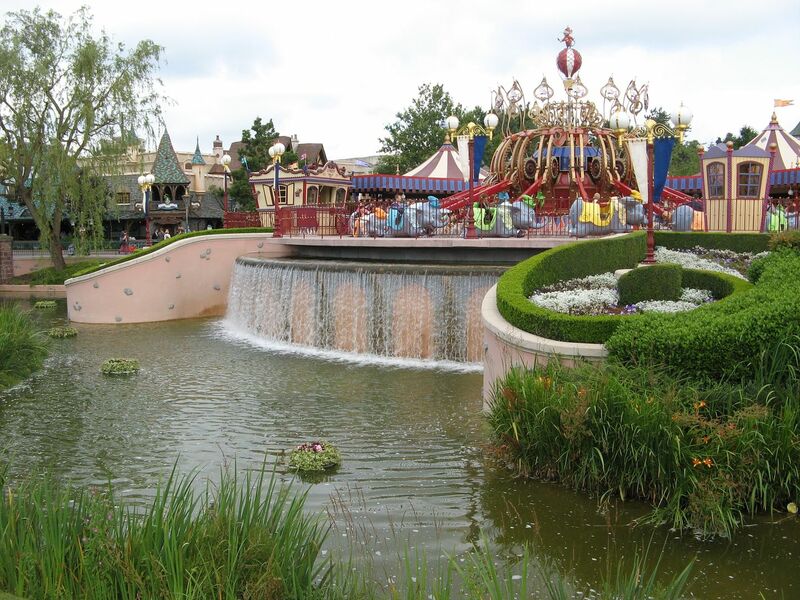 The land is also home to Alice's Curious Labyrinth, a well themed and fun way to loose yourself for a half hour with plenty of animated show effects and visual gags from moving figures to jumping fountains. Climbing the castle spire at the finale offers great views of the land and beyond, and of the second castle in the land. a semi hidden staircase down to the castle dungeon, also accessible via a second bridge from the hub. Both entrances lead to the cave like dungeon, with a spectacular animatronic dragon sleeping in a lake. The dragon breathes, flicks its tail, and occasionally wakes, its huge head watching the guests from a safe distance as smoke bellows from its roaring mouth. A great show that can be watched for ten minutes or more, and a great example of details of original DLP. 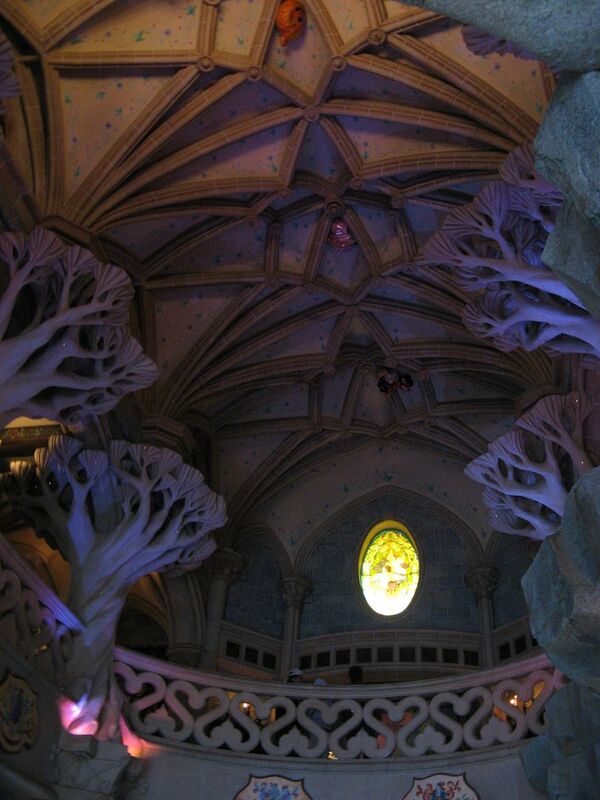 Back upstairs, Fantasyland offers plenty of places to eat. 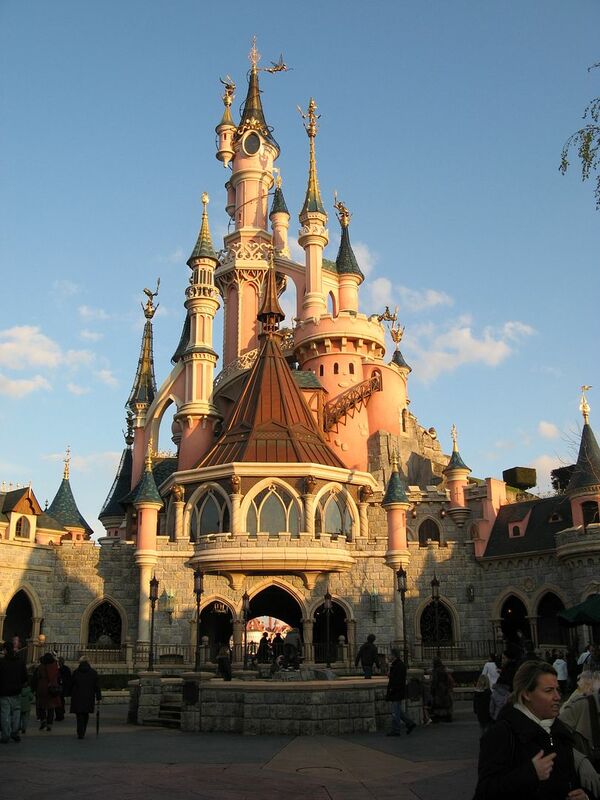 The most expensive is Auberge de Cendrillon, the parks signature restaurant. The favourite of Michael Eisner and with its own private courtyard, this is DLPs Cinderella's Royal Table but at the side of the castle and not inside it. Toad Hall looks identical outside to Disneylands, but is counter service food. 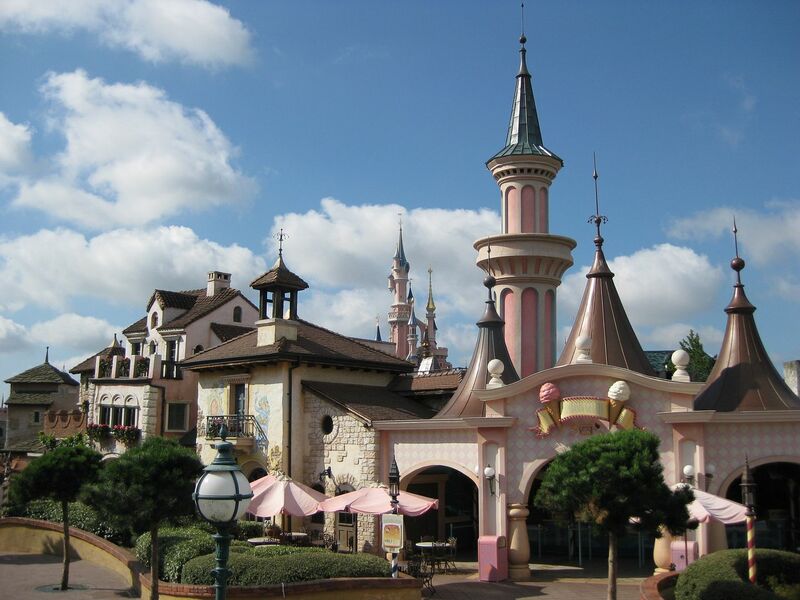 The huge Au Chalet De La Marionnette offers burgers, dogs, chicken and salad as a counter serve with a nod to the Disneyland versions error around the edit sign. 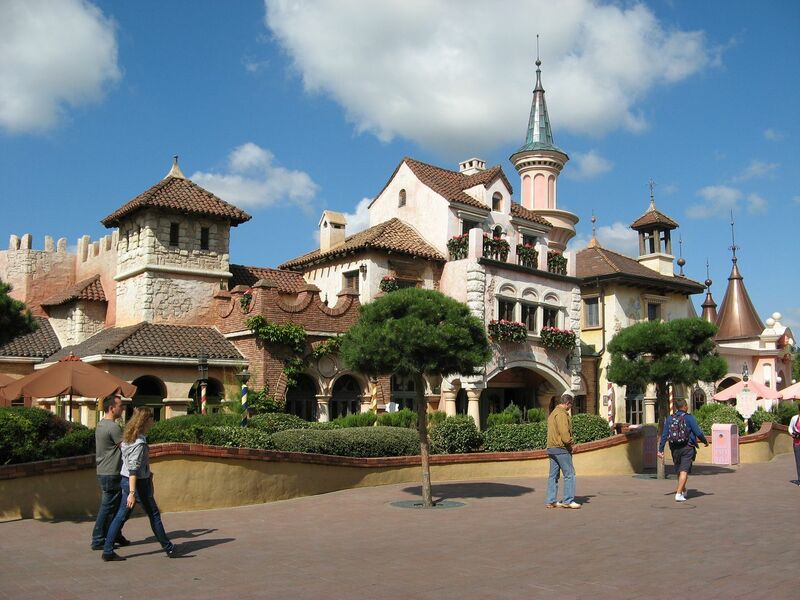 Past Small World is Pizzeria Bella Notte, a large counter service pizza restaurant. Like the other eateries, the detail and theming both inside and out is spectacular. And so we reach the final land, Discoveryland. Accessed from the hub or a landscaped pathway near small world during peak season, the land was the first to be designed as a future past area. Taking hints from Jules Verne and HG Wells, it is a curious mix of 90s future, retro theming with a Steampunk touch, and 50s retro. Another land that looks as good at night as in the daytime, covered in creative lighting touches and neon. Entering from the hub, the pathways meander around rock work sticking out of the ground and pools of water that would appear later in the US parks. 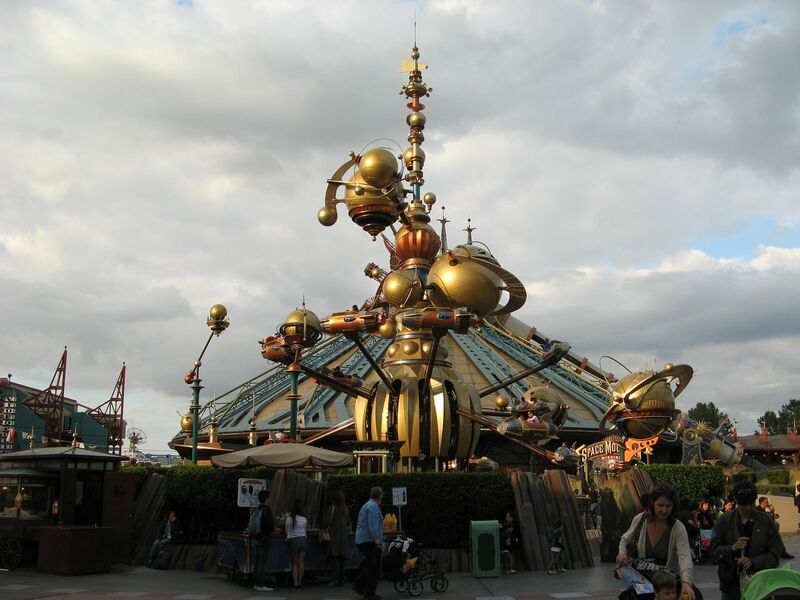 Right in front is Orbitron, at ground level, and the spinning ride inspiration for Disneyland's makeover. 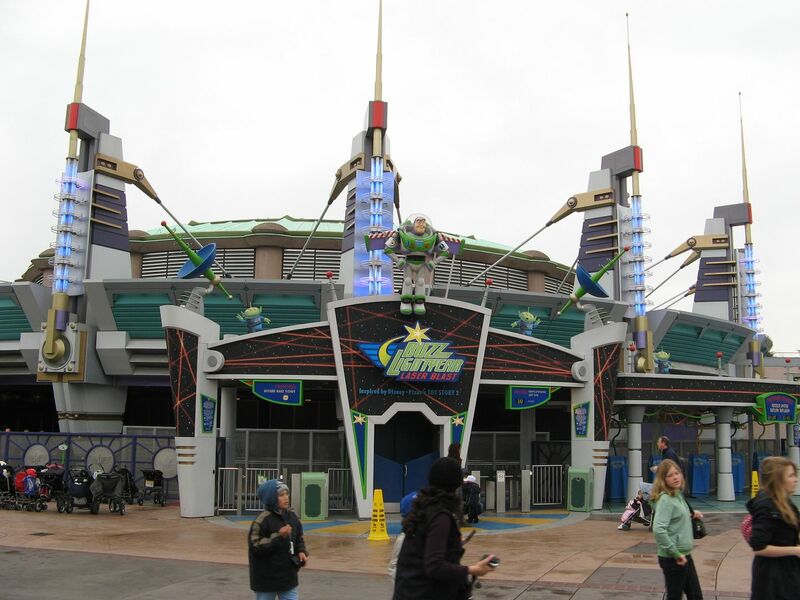 To its left is the original home of Timekeeper, now Buzz Lightyears Astroblasters. 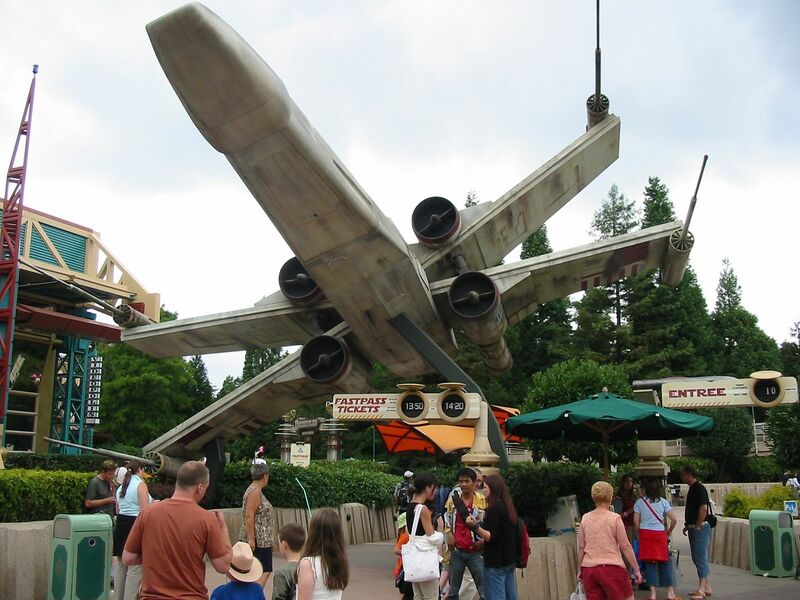 Similar to the Disneyland version and with upgraded effects, this ride is very popular. And yes, the guns are removable! 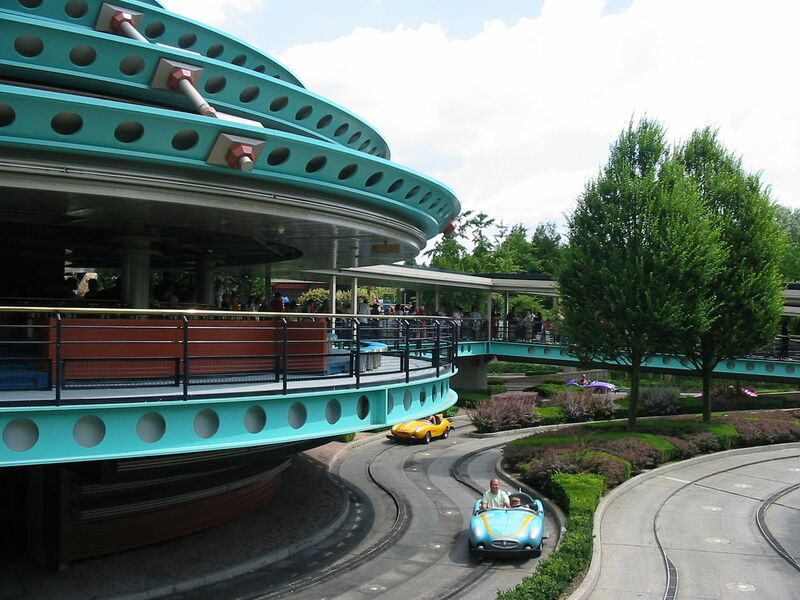 Crossing the land is Autopia, a multi level raceway through a nicely landscaped land of the Future with plenty of single lane roads, bridges and racing straights. The multi level circular station design is stunning. Back across the land is the Hyperion restaurant, offering fast food burgers and fries with tiered seating for hundreds overlooking a huge stage area. Currently this stage just shows cartoons on screens, hopefully in the future it will feature a return to the lavish live productions of the past. 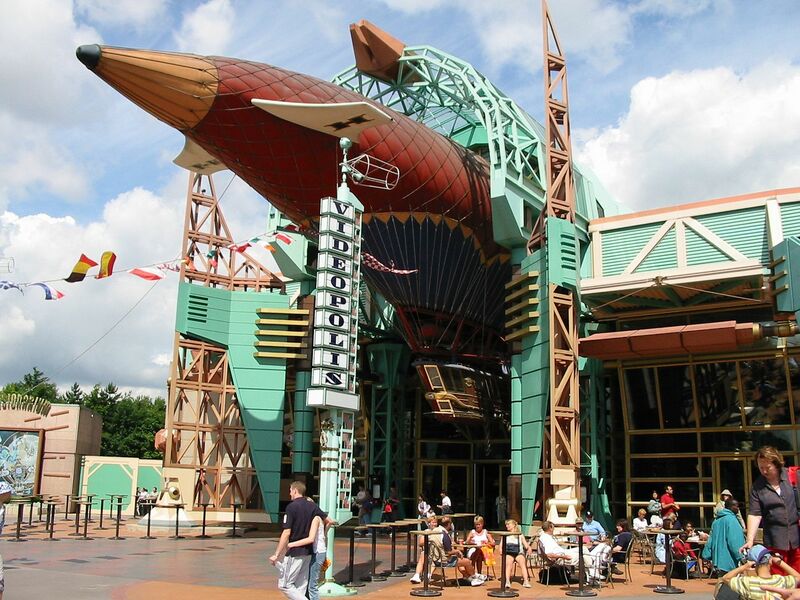 This is the building whose main entrance has the full sized airship moored above it. a peak season Pizzeria that may also be rethemed to a Lucas IP. Acting as an anchor for a certain mountain is a lagoon with a full sized Nautilus Submarine docked in it. A spiral staircase takes guests down to a lower level for a large, elaborate Captain Nemo walk through complete with a giant squid attack. Another great walk through attraction layered in detail. attached station. No surprises this is one popular attraction, and very different from the other 4 of the same name. Stood outside, the partly exposed launch track is clearly visible as the show canon fires trains into the mountain every minute or so. Standby line takes a walkway though the mountain itself, sadly with the original viewing windows mostly covered over apart from one that still offers an impressive, themed ride view. Fast Pass and standby merge in the mountain, and continue to wind around, over, and under the ride path. 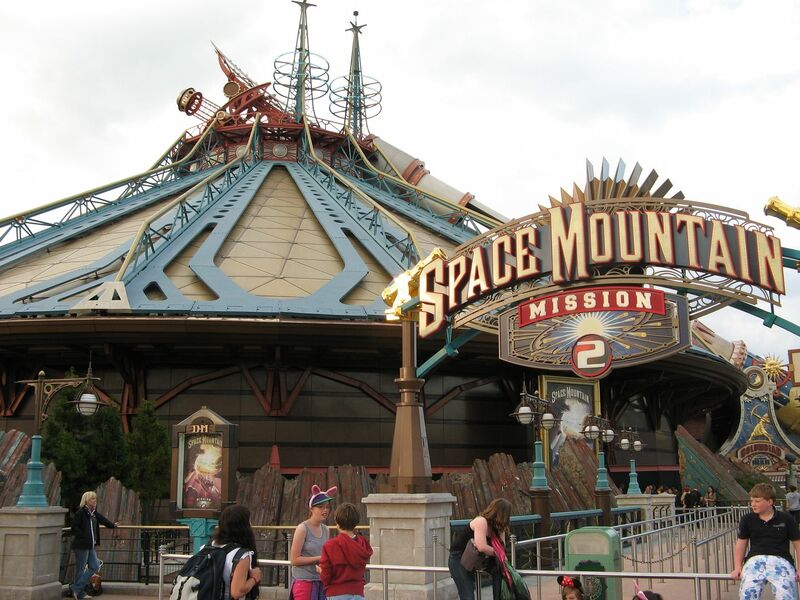 The ride was rethemed Mission Two: Supernova in 2005, the mission now travelling far further than Mission Ones moon but with nods in the queue line to the 1995 version. The queue ends in an attached split track load / unload station and the fun begins. Over shoulder harnesses hint this is no family coaster. Trains depart the station, make a U turn and dive under the exit walkway to come to a halt at the base of the worlds first inclined launch. With a countdown and LED lighting, a burst of smoke and light sees the trains launch up and into the top of the mountain, where the onboard audio also kicks in. The audio and train seating are due an upgrade soon to address a known reliability and comfort issue. This ride can be a headbanger but is so worth it, and is so full of visual effects you have to keep your eyes open. Star fields, animated comets, physical rotating asteroids, physical and projected planets and an exploding supernova are just some of the effects to see. A second lift hill offers some respite between the three inversions. For Americans, this is a Space Mountain like no other, and more akin to Rock n Rollercoaster. 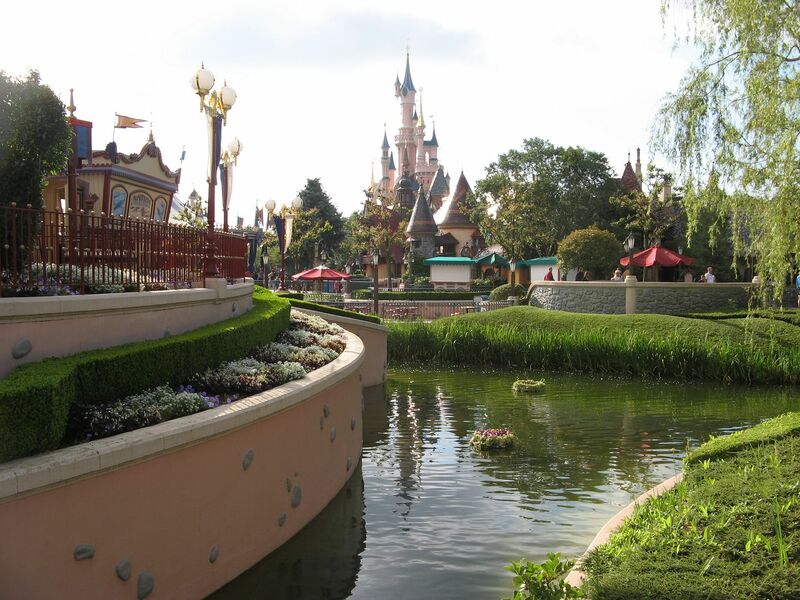 And so, that's Disneyland Parc. In the daytime. Next I'll look at entertainment, parades, and Disney Dreams!